"From the wisdom of ancient cultures to modern neuroscience, the authors skillfully create a bridge of understanding between the practice of meditation, yoga, and psychotherapy. The Simpkins are at their best in describing how everyone can learn to integrate their own brain, body, and mind to facilitate a creative synchrony of healing and well-being." "This reader-friendly text is directed toward therapists and healthcare workers who are considering incorporating yoga and meditation into their work. These technologies are time-honored and appear to have beneficial effects on contemporary clients and patients. 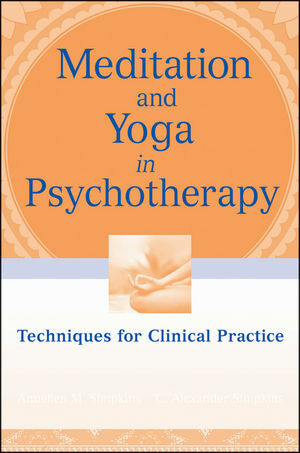 Meditation and Yoga in Psychotherapy serves as an informative introduction to these¿practices, and explains how a therapist might integrate such practices into their work. The chapters on neuroscience research and healthy aging are unique in books of this nature, and the discussion of alleviating depression alone is worth the price of the book." Meditation and Yoga in Psychotherapy is an inspiring "how-to" guide grounded in the neuroscientific and clinical evidence that supports the use of meditation and other yoga practices to improve clients' mental health. Filled with vivid case examples and writings from renowned yoga masters, Meditation and Yoga in Psychotherapy encourages a therapeutic process in which clients move their attention from outside concerns to inner mindfulness. With a range of techniques that embrace the diversity and uniqueness of clients, this book offers methods to creatively individualize techniques for a wide variety of presenting problems. ANNELLEN M. SIMPKINS, PhD, and C. ALEXANDER SIMPKINS, PhD, have extensive training in psychotherapy, meditation, yoga, and Zen. They have clinical, teaching, and research experience using meditation either as the primary method or in conjunction with other forms of therapy. They are the authors of several books on meditation, yoga, psychotherapy, and hypnosis, as well as books on several Eastern philosophical traditions.